My children (now teens) have attended Compass for over 5 years. The offerings are incredible, and the high standards for teachers continue to amaze us. The directors bring in the right people for each class. Stage combat is taught by a professional stage combat actor, the science classes are generally taught by folks with PhDs, an architect teaches architecture, etc. My children have had many opportunities we couldn’t have provided for them otherwise, all on one campus. The directors and staff have their sole focus on providing positive educational opportunities for students. They are mothers who understand kid behavior and strive to make each class a place of learning. 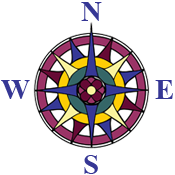 “My children, now teens, have been attending Compass classes for several years. The classes offered are incredible and cover the gamut…everything from foreign languages to fitness, from STEM to art and architecture…classes for kindergarten through high school…and all on one campus. Seriously! With every class in which my children have been enrolled, I’ve been impressed with the instructors and content covered; I’ve also been pleased with small class sizes that enable my kids to learn in a group setting while still receiving quality, individual attention. The director maintains high standards for instructors and works carefully to ensure that parents and students get the most out of their Compass experience. The director and her staff are attentive to the needs of families and are clearly committed to providing a safe and wonderfully expansive educational experience for homeschool families in the northern Virginia area.